Stephen Lowey – World Learning Inc.
Stephen Lowey held a trusteeship with World Learning Inc. from 1986 to 2000. He was board chair from 1997 to the end of his term. In October 2000, he was named chair emeritus. Lowey was an Experimenter to France in 1952 and a group leader to France in 1957. 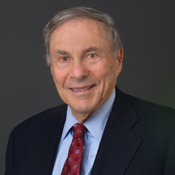 In 1968, Lowey co-founded the law firm now named Lowey Dannenberg Cohen & Hart, P.C. a highly regarded litigation firm, representing institutional and individual investors and consumers in actions to recover financial losses. He attended and graduated from Woodmere Academy, Harvard College, and Columbia Law School. He served in the United States Coast Guard Reserve from 1959 to 1967 and as assistant U.S. attorney, Eastern District of New York, from 1961 to 1964. Stephen and his wife, Congresswoman Nita Lowey (D-NY), recently celebrated 50 years of marriage. They have three children and eight grandchildren.